Toyota announced that it has increased the price on its base 2008 Sequoia SUV by $990 over the outgoing model. The 2008 Sequoia will start at $34,835, including a $685 destination charge, when it goes on sale in late December. 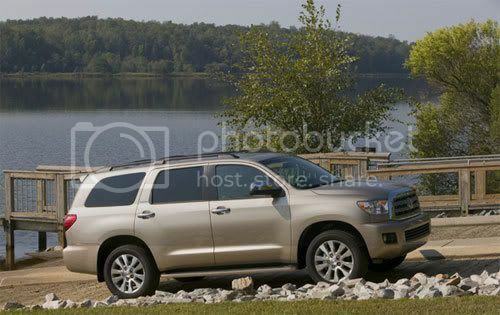 The flagship 2008 Toyota Sequoia Platinum 4x4 model carries a Lexus like price tag of $56,285, including shipping. Toyota did not offer a Sequoia Platinum model in 2007. The range topping model last year was the Sequoia Limited 4x4, which started at $46,345, including shipping. For 2008, the Sequoia Limited grade with the standard 5.7-litre V8 starts at $45,910 for the 4x2 model. The Platinum model includes deluxe items like 20-inch diamond-cut-finish aluminum wheels, rear load-leveling air suspension, a power front seat memory package, heated and air-conditioned ventilated front seats, heated second-row seats, a power rear door, a tilt and slide sunroof, headlamp cleaners and a navigation system with a back-up camera.